Posted December 5, 2018 by Andrea Laford & filed under Headlines, News, Spoilers. 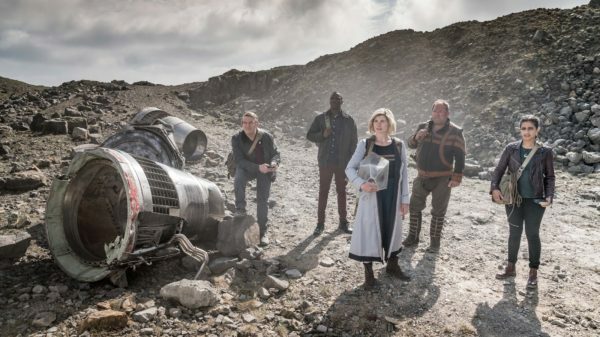 According to an article in TV & Satellite Magazine, which features an interview with showrunner Chris Chibnall, Team TARDIS will face some inner struggles in the Doctor Who series finale, The Battle of Ranskoor Av Kolos. The Doctor, Graham, Ryan and Yaz race to find answers, but as they try to understand what’s taken place on the intriguing planet, they start to wonder if their biggest struggles lie within themselves. The Doctor and her companions receive nine separate distress calls, all originating from the mysterious planet of Ranskoor Av Kolos, littered with the remains of a terrible battle. The only clue to what has happened on this world is a commander named Paltraki, who has no memory. Who or what are the Ux? As further secrets are uncovered and strange forces gather in the mists, the Doctor and her friends are going to be tested with a deadly and emotional reckoning as they start to wonder if their biggest struggles might lie within themselves. How far have they come and how much have they learned? Are they going to make mistakes at a crucial moment? What is the mystery behind Ranskoor Av Kolos in this “big and explosive” series finale? Part of the answer might be here and the Doctor hears a familiar voice in one of the trailers.